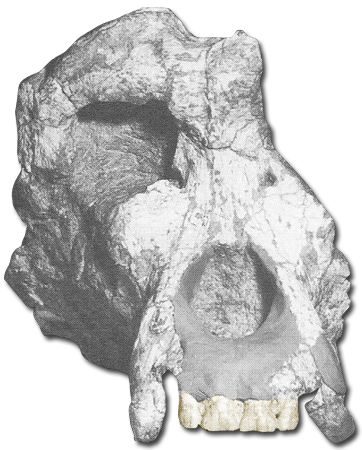 Ouranopithecus macedonias was the largest European hominoid. Estimates made with associated dental fragments suggest that males weighed approximately 242 pounds (Stanford). Sexual dimorphism is seen in canine and mandibular formations. The male canines are tall and compressed whereas the females’ are low crowned and broad. The female mandible is robust compared to the tall mandible of the male (Hartwig). Ouranopithecus possessed a massive brow ridge, a wide interorbital space, and a robust and biconvex premaxilla. Many researchers suggest that based on facial morphology, Ouranopithecus has close affinities to Dryopithecus and gorillas (Hartwig).